Anamur is the westernmost town in the province of Mersin. Driving from Antalya, Anamur is the first town you enter in Mersin. It is a coastal town 230 kilometers to Mersin’s city center. It is Turkey’s banana production area. The “Anamur banana” is a special type of the fruit that has a very pleasant aroma. In recent years, Anamur has also been coming forth as a tourism center. With its long and wide sand beach, clean sea, historical wealth and its houses that have a very special local architecture Anamur is becoming a tourism center offering quite a wide spectrum of attractions. It is a town bordering on Antalya in the Mersin province. Anamur is 230 kilometers to Mersin and 125 kilometers to Alanya. It produces Anamur bananas, a small but aromatic banana type. The Museum of Anamur: Yalıevler, Fahri Görgülü Street 8. Anamur Festival is held every year during the last week of July and it lasts for two days. It is thought that the name Anemurium or Anemurion comes from the Greek word “anemos” which means wind. In the Antiquity, as it is today, it was an important port linking Anatolia to Cyprus and from there to the shores of Africa. Like all the other port cities that got rich by trade on the Mediterranean, Anemurion too was under the constant attack of the pirates. Mountain tribes living on the heights of the Taurus Mountains were also a threat for the city. In the year 382 A.D. Romans built walls around the city to defend it against the attacks by these tribes. The churches in the town belong to 5th Century A.D. The city lived a second period of prosperity during this century. In the year 650 A.D. Anemurion began losing its importance in the sea trade as a result of pillaging of Cyprus by the Arabs. In the 8th Century. Arabs began raiding Anatolia too. For a long period Anemurion changed hands between the Arabs and the Byzantines. Then came the period of Seljuk Turks and Karamanogullari principality and finally, during the second half of the 15th Century the city came under the rule of the Ottoman Empire. You can park your car next to the ticket office at the entrance of the ruins. After that you have to walk. During summer days, the place becomes quite crowded. One of the favorite beaches of the area is just in front of the ruins. Those who come for bathing also pass through the antique city. The ruins begin just after the beach and spread towards the slopes of the mountain behind. Considering the hot climate of the region it is wiser to tour the ruins either in the morning or late afternoon. From time to time you can rest under the shadow provided by the carob trees, a feature of the Mediterranean landscape, as you tour the antique city. And at the end of the tour you can a take a dip in the Mediterranean for reviving yourself. It is so near! Most of the buildings that still stand among the ruins are dated to the 1st Century A.D. It was British admiral Sir Francis Beaufort who in 19th Century discovered the antique city of Anemurion for the Western world. First excavations were carried out by Elizabeth Alfoldi-Rosenbaum from the University of Toronto. Later another Canadian, Prof. James Russell continued the work. Excavation work was terminated in 1998 and some of the objects uncovered are exhibited at the Anamur Museum. The town can be separated into two sections: Upper Anemurion and Lower Anemurion. Ruins of Lower Anemurion consist of antique city walls, three public baths, a 60-meter diameter unfinished amphitheater (4th Century A.D.), an odeion (Concert hall), a palaistra (a place where martial arts where executed), aqueducts and churches. The mosaics found on the floor of the church at the necropolis and in other buildings are exhibited at the town museum. In the Upper Anemurion on the slopes of the mountain there are about 350 barrel-vaulted, two-story tombs of which there are no other similar examples elsewhere in Anatolia. The ruins of an ancient city at the northeastern part of the Anamur promontory covering a smoothly rising area 250-meters wide and 1,700 meters long, belong to the Roman – Byzantine period. The small Roman town at the southern tip of the peninsula begins with 8-meter high sloping seawalls with towers. The walls that begin on the shore follow the rising landscape and they are 424 meters long. The Hellenistic settlement is thought to be on the rocky part of the peninsula. But there is not much here that has survived until our day. During the excavations a square-shaped tower was uncovered on the upper part of the rocks. The area covered by the early roman settlement has lost its original shape because of the structures built here during the Middle Ages. Until now, no sign of the temples that ought to exist either on the acropolis or within the boundaries of the city was found. During the Roman times, the water supply of the town was provided by a canal. This canal carried water from the plain near the village of Nasrettin to the eastern section of the antique city. A second canal built in the 3rd Century A.D. was bringing water to the lower parts of the city. The necropolis is separated from the city by road. The oldest tombs built during the imperial period are made of unhewn stones. They are barrel-vaulted, simple structures. The tombs that belong to later periods are double-chambered graves. Those that were built during the 3rd Century have niches, mosaic floors and wall paintings. Like it happened in other cities, the tradition of building monumental tombs also ended here by the end of the 3rd Century. However, the existing tombs were used for burials until the 7th Century. The churches built during the 5th Century at the settlement area indicate the second period of prosperity of Anemurion. Out of the four churches here, three were built during this period. The churches are in the form of basilicas. They have narthexes, floor mosaics and inscriptions. Two more public baths were built in the city at the end of the 4th Century and the mid 5th Century. According to archeological finds, an acute drought hit the city mid-6th Century and continued until the 7th Century. This drought was probably the reason why the city was abandoned in the 8th Century. It is not known whether some of the families doing farming in the area continued to live in the city after most of the population abandoned it. It is a small and cute museum. Objects found at the excavations of Anemurium and at other archeological sites in the area are exhibited here. The museum was opened in 1992. Objects sent from here to museums in Alanya, Silifke and Erdemli were brought back and put on display at this museum after it was opened. There are also objects found at the excavations of Nagidos and Kelenderis. Local people also supported the museum by giving objects of archeological value they found in the area. Archeological objects belong to the Hellenistic, Roman and Byzantine periods. There is a bronze Athena statuette, a tiara with motifs in relief, oil flasks called lekythos with black figures, clay statuettes and lamps and mosaics depicting scenes from mythology are on display at the museum. Ethnological objects are exhibited at a separate section of the museum. Among these objects are local kitchen utensils, examples of folk costumes, jewellery, textiles, weapons and work tools can be seen at this section. Objects related to nomadic lifestyle are especially interesting. We have already mentioned the sand beach in front of the antique city of Anemurium. There are a lot of sandy beaches in Anamur. The seaside of the town center is a sand beach too. When you turn left at the junction where the statue of woman carrying a bunch of bananas on her shoulder is standing, you will arrive at the seaside. The long breakwater divides the seaside into two. The wide sand beach stretches for kilometers. The sand is very fine. Right behind the sand beach there is a row of hotels, restaurants and café-bars. The sea is very clean and it sparkles like a crystal surface. The hotels on the seaside serve also the bathers by providing beach chairs, umbrellas, snacks and refreshments. There are also stands on the beach that provide equipment for those who want to do water sports. The road right behind the beach is closed to traffic in the evening hours and turns into a promenade for the townsfolk and visitor to walk. There are motorboats moored at the breakwater. These motorboats can be hired for the day. In the evening they organize tours along the coastline. They take you along the coast of the antique city and the castle Mamure. If you hire the boat as a group of friends, the captain will follow the route you choose. The entrance to the beach is free. Part of the beach in front of the hotels gets a bit crowded but the beach is so big and long that you don’t have to walk very far to find a quiet place. The examples of civilian architecture seen in this region, especially in Anamur and also in Bozyazı and Ortaköy can be generally divided into three categories. They all come under the generic name of Anamur Houses. Archeological research has shown that even during the ancient civilizations people had second houses up in the plateaus in addition to their permanent residences at towns on the coast. Excavations on the plateaus of Abanoz, Güğül, Demiroluk. Şıhardıcı, Domuz Beleni and Çandır have yielded marks of ancient settlements. It is known that when the Turks came here they were leading a nomadic life earning their livelihood by animal husbandry. They passed the summers on high plateaus and descended down to lower lands during the winters. With time, tents were abandoned in favor of wooden plateau houses with sharp roofs and wide porticos. Now we come across concrete villas on these plateaus. These small houses called “sayvant” on the plateaus were simple buildings with an average covered area of 15 – 20 square meters. Yörüks, as they are called locally, would pass the four to six months of the summer here and return to lower areas at the beginning of the winter. They would leave those wooden houses up on the plateaus to be used for next summer. In later years this type of building became fashionable on the plateaus and rich people began building large sayvants in the plateaus as summerhouses. These houses were made of black limestone, mud and cement and a wooden structure with a sharp roof on top. In the old days the roofs were covered with juniper bark but now zinc is used. With the advent of motor vehicles and roads that take them up to the plateaus, bricks and cement are taking the place of this old traditional architecture. Sayvants are forgotten now. There are only a few examples left on the plateaus. In the towns along the coast, there are three types of houses according to the level of income of families. These are two-story houses with many rooms where the rich people live. Single story houses are for the middle class and the poorest live in houses consisting of a single room under an earth-covered roof. But whatever the income of the family is, there are no houses without gardens in Anamur. Because, most of the daily life passes in the garden. The ground floors are used for animals and their feed. The living quarters usually look either towards north or south. Usually, the best scenery is preferred for the windows of living quarters. The Ground Floor: Two more doors are opened in addition to the main door on this floor. One of them is for visitors and other is for service. In front of the doors there is usually a small area covered with marble. This marble area was used for loading and unloading camels, horses and mules used for transportation of goods. Service door usually opens to the garden in the back of the house. In this part of the house there are storage rooms and pantry. The main door and the visitors’ door open to the street. The main door leads to a staircase inside that ascends to the first floor. On the first floor there is generally a spacious middle room, the kitchen, bathroom and sitting rooms are on this floor. Each window has a smaller one on top. There are fireplaces in every room. In the winter they are used for heating but in summer too they are useful. They help circulate air and keep the room cool. Every single room is equipped to function as a bedroom, study, sitting room or dinner room. The second floor is actually a single room sitting on the roof of the first floor. This room, which is surrounded on four sides by a porch-like covered balcony, is the called köşk by the locals. It is the most prestigious part of the house. People sitting here can enjoy the scenery through the big windows just by sitting next to them. The köşk is the unique feature of the Anamur houses. Its roof is covered with tiles. First floor roof which you can see from the köşk is covered by wooden plating that sits on a truss and the wooden plating is covered with pressed soil. This part of the house is locally called “dambaş.” The soil is pressed using marble cylinders (usually cut from antique columns) so that it does not leak during rain. The dambaş is used for a number of purposes. In summer vegetables and fruit are left here to dry under the sun and the family sleeps here during very hot summer night. The houses of the poor consist of a single room and a kitchen. They are usually L or T-shaped buildings. If necessary, new rooms can be added to the house. The top of the house is generally flat and covered with pressed earth. The roof is used for purposes similar to those in the rich people’s houses. Only, the poor use a ladder to climb up to their roof. Although some of these houses have succumbed to time and disappeared. But there are still those well preserved and well looked after houses where families still live in. Another interesting feature of the Anamur houses are their chimneys. Some of them are round, some square shaped and some are conical. Although, worn-down, Hacı Ali Bey mansion is one of the beautiful examples of Anamur Houses. Anamur is the Banana Country in Turkey. Almost all of Turkey’s banana produce comes from Anamur. So it is generally called “The Anamur Banana.” It deserves the name because it is quite different from the imported plantation bananas. It is small but has a special aroma and a delicious taste. Until Turkey liberalized export and import trade, the only kind of banana known to the Turks was this extremely delicious, fragrant fruit growing on this coastline. With the explosion of imports, Turks got acquainted with the bananas produced by the plantation industries in Latin America and South Africa. Importation of bananas led to hot debates among the public. Imported bananas were bigger in size and cheaper in price compared to the indigenous Mediterranean bananas. But they did not have that sweet aroma and delicate taste. When imported bananas flooded the market with their cheap price, local banana producers felt the pinch and banana production in Turkey fell sharply. Banana plants were first brought to Turkey in 1750 by a rich family who had ties to Egypt. Originally, the banana tree arrived in this country as a garden plant. When it was seen that the plant also bore fruit that tasted quite delicious, people started planting banana trees after 1930 to sell its fruit. The development of banana production began in the 1950s and it continued to grow especially in the region of Alanya and Anamur until 1984, the year when plantation bananas showed up on the Turkish market. From this year on, local banana production has been falling to lower levels compared to past years. The worst enemy of banana producers is frost. It is quite rare here in the Mediterranean region to see the temperatures drop below the freezing point. But, once it hits, the entire banana crop is destroyed. That is another reason why the producers are now somewhat reluctant to grow bananas. Those who do have taken their plants into greenhouses to protect them against the frost. Plastic greenhouse materials are not prohibitively expensive anyway. The kind of bananas produced in Turkey is called Musa Cavendish or Dwarf Cavendish, probably due to the shortness of the plant. The body of the banana plant is like an onion below the earth surface. Leaves sprouting out of the body multiply above the surface and the leaf stems one over the other form the “fake” body of the plant, which is not a real tree trunk. After 25-30 leaves grow above the surface, a stem carrying a cluster of flowers appear on the “fake” trunk and rise into the air from among the leaves. The cluster of flowers turn into bunch of bananas in time. The banana fruit ripens earlier at the beginning of the summer and later by the end of say August. The fruit is cut from the plants flowering in June in 76 days at the earliest and 110 days at the latest. The fruit is cut from the plants flowering during the first week of July in 124 days at the earliest and 138 days the latest. But the bananas that flower during the first week of August do not ripen before December 27 and January 18 at the latest. That is to say in an average of 153 days. For the plants that flower second, third and fourth week of August, the ripening period for the fruit is 162, 164 and 173 days respectively. Don’t be startled if you hear noises from a banana grove you are walking by in the month of August. It is the banana plants “giving birth.” Locals also call this process “giving branches.” While the flowers break their outer crust to form banana clusters, a noise is heard. The flowers bend towards the ground while the fruit sticks up to form the banana bunch. This process is so quick that you can watch it happen. After the bananas are cut from the plant, the tree does not bear any other fruit for that season. Harvesting starts slowly in September and October and picks up speed in November and February. These are the months when an abundance of bananas are seen on the stalls. Bananas are usually collected when they are still green. They turn yellow in refrigerated storage. To delay ripening they are stored in ventilated chambers where the temperature is kept at 12.5 ̊ C. Ripening can be delayed as long as three to four weeks. The temperature is raised up to 16 ̊ C to start the ripening process. The fruit is sprayed with ethylene for a homogenous ripening. The old process of ripening by carbide is not used any longer. It is obvious that Anamur is a Banana Country because everywhere you look you see bananas growing on trees, in greenhouses, in the gardens. The people of Anamur have shown their gratitude to the banana that has such an important place in the local economy by erecting a woman carrying a huge bunch of bananas on her shoulder at the busiest junction in town. 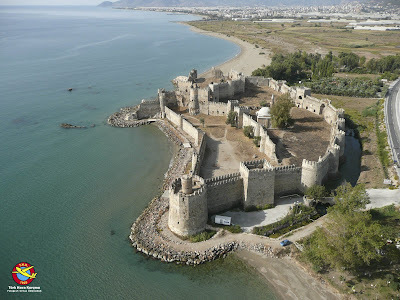 The Castle of Mamure, which is the symbol of Anamur, is on the 8th kilometer of the road to Mersin. It stands on the seaside. The castle, which was built by the Romans in the 3rd Century A.D., has been repaired many times during its long history. That is why it is in very good condition today. The castle has a kidney-shaped plan probably drawn so that it can fit the landscape here. It has two main sections. Two concentric walls surround the castle. It has 39 ramparts, four of them quite big. There is a 22-meter tall tower rising in the middle of the big rampart at the eastern side looking over the sea. The marble plaque on the tower says that the castle was repaired by Karamanoglu Ibrahim Bey. During the repair (1300 – 1308) work a mosque was also built in the castle. The entrance of the mosque is a low-arched door. The mosque has a central dome and its walls have been made of bricks and stones. Across the road there is a Turkish bath. The entrance to the bath has collapsed but the hot and cool chambers are still intact. It is a small structure built with unhewn stones supported by wooden horizontal beams. The dome rests on triangular pendentives. Ornamental figures on the walls have disappeared during repairs. While touring the castle you can climb up to the ramparts and walk on the walls. The nearest settlement to the castle is the village of Bozdoğan. It is just next to the main road. Restaurants on the beach serve both lunches and dinners. In the evening dinner tables are set next to the sea. In moonlit nights the scenery is fantastic. The castle shines under the silvery light of the full moon providing a wonderful backdrop to a dinner on the seaside. The menus of the restaurants here are very rich indeed. Main dishes are mainly consist of seafood but there are also delicious appetizers made of a myriad of herbs gathered from natural environment. If you get tired by touring the castle, there are restaurants and cafés across the main road. You can eat snacks and have refreshments here. There are also hotels and motels around where you can have a meal. As the road smoothly rises going east, we suggest that you stop and take another look at the Castle of Mamure from above. The recent history of Anamur as a town is also quite long. Walking in Anamur, you will come across mosques, caravanserais, castles and Anamur Houses that we have are describing in a different chapter in this book. All these historical structures come from different phases of the town’s history. This is a mosque according to a central plan with regularly cut stones. The mosque is at the Akarca neighborhood of Anamur. A low, arched door serves as the entrance to the mosque. Just opposite the entrance there is a stone altar. The wooden altar next to it is not original. It has been made much later. To original of the minaret to the left of the entrance was wooden. Now there is a fluted, single balcony minaret that was built later is rising there. This is a stone building just across from the Ak Mosque. The building has a vaulted ceiling. The Ermenek road that links Anamur to Central Anatolia existed throughout history and played an important role in development of trade. Today, the road is asphalt covered and the bends get more frequent as it rises towards the Taurus Mountains. It is better to drive along this road during daytime both because it is safer and also there is beautiful scenery to admire. As the road rises the geography changes. In wintertime, snow blocks this road from time to time especially at the heights of the mountains. The Sualmaz pass on the road is situated at an altitude of 1,690 meters. When you follow the road of Abanoz plateau you arrive at a very beautiful picnic area called Sugözü. There is a freshwater spring here under a rock. The water gushes out of the rock, passes under a huge plane tree and flows into a brook. There is also a simple open-air restaurant here that serves simple dishes and refreshments. There are ruins of an ancient city on top of the hills to the left of the Abanoz plateau, which is dotted with modern villas today. But the ruins have been destroyed badly. Only a few rock graves can be seen at the necropolis to the right of the antique city. Abanoz is the largest plateau of the area. But there is very little left from the traditional plateau lifestyle. There are restaurants, a butcher shop, grocery market and even a motel. While making a tour of the area you can spend a cool night in the motel. The most popular dish at the restaurants on the Abanoz plateaus is of course, roasted baby goat. The restaurants also serve alcohol. After you pass from Abanoz, you can see in a forest Roman rock graves with their triangular pediments and columns. The Boncuklu Castle is on the hills left of 3rd kilometer of the Ermenek road. It is inside a forest. The building is made of hewn stone and it has an oval shape. Kizil Kilise (Scarlet Church) is 8 kilometers to the north and it is situated at the Kızılaliler village. The church is a basilica built in the 5th or 6th Centuries. At the village of Yakacık on the road to Alanya there is an observation tower built in the 5th Century. Continuing from the tower, we come across the Otak chapel 10 kilometers later on the banks of the Kaladran brook. Both along the coast and up on the plateaus and mountains there are numerous historical ruins. But no scientific research has been done at most of them and it is hard to say they are protected. There is no environmental arrangement nor any protective measures. That is why most of them are in dilapidated condition. The town market is held on Fridays and Saturdays. Even if you are a traveler staying at a hotel and you don’t have to buy anything, you must come and see this very colorful and lively marketplace. There are fresh vegetables and fruits and textiles. You can the Anamur banana here cheaply. The vendors are mainly the producers themselves. Right in the vicinity of the marketplace you can also see the traditional Anamur houses. There are the villages of Ovabaşı and Kalınören to the west of Anamur. The ruins of an ancient city spread from inside the Kalınören village to the hills in the north. These ruins that cover quite a large area are known to belong to the city of Titiopolis. George Evart Bean and Terrence Bruce Mitford who conducted archeological research here in the years 1964-68 pointed out that the ruins in the Kanlıören village belong to Titiopolis. The ruins carry the marks of Hellenistic, Roman and Byzantium civilizations. It is thought that this city was not under the sovereignty of Anemurium but an independent city-state of its own. There is no sign of important buildings like the bouleuterion (parliament), nympheum (dedicated to water fairies, usually a fountain), odeion (Concert hall) and amphitheater. The ruins of these structures may still be buried under the Kalınören village. However, parts of the city walls are still standing. The walls are made of roughly cut rocks of different sizes. There is a spiral column made of gray stone in a garden at the entrance of the village. This column must have belonged to an important building. There are also pieces of floor mosaics scattered around the gardens in the village. The ruins of a bath seen as you climb the hill must have been a part of the gymnasium. There is a basilica to the west of the bath. Big tombs of stone with carved ornamentation are seen in the necropolis. Another structure that still maintains its shape somewhat is a vaulted public bath with three sections. The number of people adopting cave exploration as a hobby is increasing. But even if you don’t have such a hobby while in Anamur you should visit the Çukurpınar, the deepest cave in Turkey, and the Köşekbükü Cave, which, they say, have a therapeutic character. The region of Mersin and Anamur is famous for its caves. Whether you are an amateur cave explorer or somebody who is doing it as a hobby and for sport, there are a lot of caves to visit in the region. Çukurpınar is the first longest cave in Turkey and 12th in the world. It has been fitted with lighting and arrangements have been made for visitors. The caves of Köşekbükü, Kazıklar, Dede, Aynalı Göl are all in the close vicinity of Anamur. Köşekbükü Cave is also illuminated inside. Local people come here to heal their respiratory disorders like asthma. Women having a problem with conceiving babies also visit this cave. The cave is located in a lush forest and there is a small shed here where the caretaker of the cave sells, tea, coffee, refreshments and snacks. During the summer the cave is open for visit between 07.00 and 20.00. The cave is estimated to be 225 million years old. There is a small entrance fee. The cave is within the borders of the Ovabaşı village 9.5 kilometers to Anamur. Gani İmdat, the village elder is in charge of the cave. If you can find him at the village coffee house he will help you and accompany you to the cave. There are a lot of choices for those who do not want to spend all their vacation on the sand beaches, under the sun and in the sea in Anamur where the sun shines 300 days a year and the bathing season lasts for six months. Even if you do not climb up to the plateaus, there is a choice of cool places nearby where you can refresh yourself. The Dragon Brook is also suitable for rafting. But during the summer, water decreases in the stream. That is why spring is the season when the rafters come here. The stream runs a course of 50 kilometers from its source to the sea. If some additional measures are taken and arrangements are made, the stream can also be used for rafting during summer holidays. The long beaches, clean sea, historical sites and the houses of Anamur are attractive but it is also very pleasant to take your time off the summer heat and have a rest next to a river, listening to the sound of water in the coolness. We turn left at the first traffic lights on the street from the bus terminal to the town center. At the end of the street leading up to the Municipality, road signs begin directing us. This is the road to Ermenek. A little further up we take turn to the left. The road continues along the valley in which the Dragon Brook flows. Ancient sources also mention this stream. We arrive at the village of Çaltıbükü 20 kilometers later. Next to the village here is a large picnic area on the banks of the Dragon Brook. An old water mill has its wheel still turning. But it does not ground wheat any longer. People are paddling in canoes in the stream or picnicking under the shade of huge plane trees. This place is called Sevgi Water Park (Sevgi Su Parki). You can bring your picnic basket yourself or you can eat at the restaurant that serves kebabs and trout. You can pick your trout from the pond. They are called “Rainbow trout” and they say it is the best of its kind. Each one weighs an average of 350 grams. The fish is served either grilled or stewed with potatoes, onions, green peppers and other vegetables. Since trout is not a very oily fish, people prefer the stew, which is much tastier than the grill. Those who are not fish enthusiasts can order chicken or meat too. There is no shortage of water here. The water flowing in the brook is clean and cold. But those who are conscientious about health can buy bottled water from the restaurant. We must remind those who may want to take dip in the brook. The water is ice-cold even during the hottest days of the summer. After all, the Dragon is born on the heights of the Taurus Mountains and its waters race down here from the cold peaks. After the meal you can have freshly brewed Turkish tea. Alcohol is also served at the restaurant or you can bring your own here with your picnic basket. Nobody objects to it. The tables are big and made of wood. They fit the environment. It is also an entertaining spot for the children. There is even a small water slide for them. If you like the place so much that you want to spend a night here, there is a small boarding house too. There is a historical bridge called Alaköprü on the Dragon Brook. The bridge is on the 13th kilometer of the Ermenek road. It has a length of 54 meters sitting on a 19.65-meter wide arch. A smaller arch was added later for the water to flow freely when at times of flood. The bridge was built during the 14th Century under the Karamanoğulları rule. But it is still in use today. There is an open-air restaurant next to the bridge, serving picnickers. There are pergolas next to the stream on which ducks and geese are swimming, under which you can grill your own meat. The restaurant provides the grills and sells meat by the kilo. This is a nice and cool spot to escape from the heat of summer days. You can try your chance by throwing a line into the stream. It is not very easy to catch them but there are trout in the water. Further up from the Dragon Brook there is a deer breeding facility in the National Park. It is a large area in the forest serving for the protection and breeding of dears. From this point, the road climbs up to the plateaus. Thank you for your insights into the Ananmur area. There is not much information that is available on the internet regarding this particular area of Turkey in English and hence your contribution is highly appreciated. Yummy.. I wanna explore the cultural and historical places of Cyprus when I get to have Cyprus luxury holidays. They seem to be so interesting.